Spytail, a premium black ginger rum, has been launched by independent spirits merchant Biggar & Leith. The new release is imported from France, and is based on a 19th Century French recipe. The rum is distilled in the Caribbean and aged, spiced and blended in a family distillery in the Cognac region of France. Biggar & Leith claims that Spytail celebrates the French deep-sea pioneers and the submarines within which they plunged to new depths. France has a long tradition of pioneering the oceans in both fact and fiction – from the world’s first mechanical submarine (it was called “Le Plongeur” and was tested on the Charente River near the Spytail distillery) to Jules Verne’s 20,000 Leagues Under the Sea and Jacques Cousteau’s exploits and innovations. 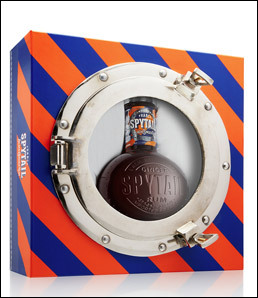 The name Spytail is inspired by the submarines of old and the bottle’s round shape is based on a Bathysphere (a primitive form of submarine). The Spytail bottle has a porthole embossed on the front and back and hidden within it are the co-ordinates of the final resting place of Jules Vernes. The navy blue and orange striped label, based on a French Naval signal flag, is adorned with engineering details from original submarine designs. The heavy stopper is crafted from metal and embossed with the words 'Voyages Extraordinaires', a nod to underwater adventurers. Spytail is bottled at 40%-42% ABV. Retail price varies by market, in the US, the 750ml is available for US$21.99-US$23.99. Spytail is available internationally.